In the Course > Discussions view, start by clicking Add a course discussion (see below for instructions). This lets you create a non-graded discussion that is attached to the course. If need be, you can later connect it to an assignment or a lesson. Click Add a Course Discussion. Enter the discussion title. The title should be a brief description of what you want the discussion to focus on. Enter the discussion topic. The topic can be as detailed and lengthy as you wish. You can use text formatting in the topic. Check whether this discussion is published or not. Students cannot participate in a discussion until it is published. Enter a date for when this discussion will first be available. Yes means this discussion is now closed to new comments/replies. No means this discussion is now open to new comments/replies. Date lets you set the end date/time, at which time the discussion will automatically be closed to new comments/replies. Check whether to allow Peer Rating. Check whether to require a student to submit a post before being able to see other students' comments. Enter the maximum number of comments and/or replies that an individual student can make in a discussion. Now that you've created this discussion, it will show up either under current or future discussions. 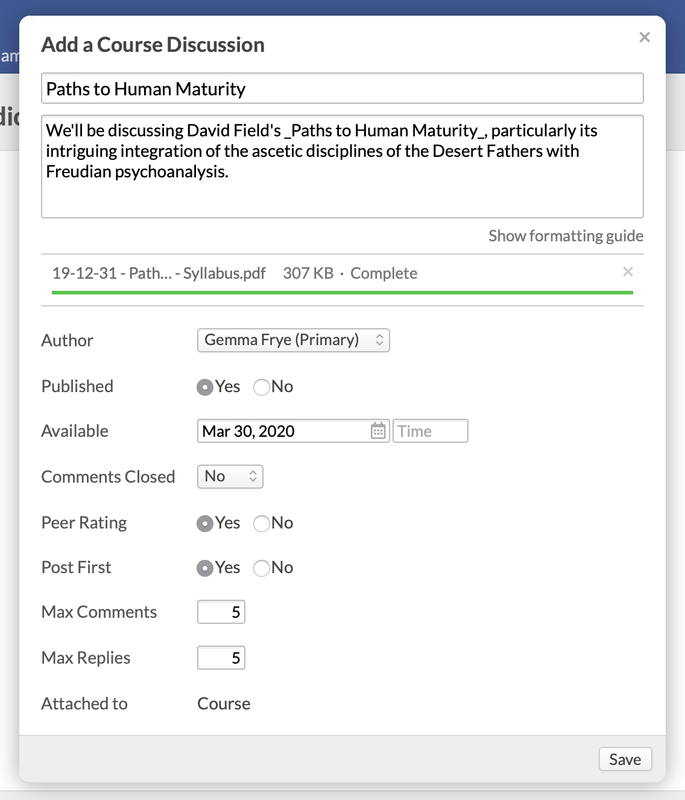 It is not graded, but if need be, you can later link it to a discussion-type assignment.